The online world is at its best when it includes everyone. Currently, three billion of the world's seven billion people are connected to the internet; by 2020 it'll be five billion. If women aren't included as equal partners in this internet revolution, we all stand to lose. That's why this week, we teamed up with Debating Europe to host a Women & Tech event in Brussels with EU Commissioner for Justice, Consumers and Gender Equality Věra Jourová, Google Europe’s President Matt Brittin, and wired women from around the world to highlight the impact of tech on women and of women on tech. Women are still vastly underrepresented in the tech sector. We make up only 30% of the workforce in the ICT sector, and 19% of digital entrepreneurs -- compared to over 30% in other sectors. This disparity begins in education, where we have a lower participation rate worldwide in science, technology maths and engineering subjects. Jourová set the tone, noting that we shouldn’t just talk about change, but make it happen. She told us about the vital work the European Commission is doing in this area, for instance by contributing to the Girls in ICT project. But there’s still a lot of work on the same basic point: we need to increase the number of women working in tech. To solve a problem, you need data. Google's aim is to organise the world's information, and one of our speakers, Lucy Hurst, had plenty to share. She co-authored The Economist Intelligence Unit's report on the gender gap, which showed that in some countries inequality between men and women is getting worse. Next, you need enthusiasm, and a will to change. One of the most inspiring speakers we heard from was Hayla Ghazal -- a Dubai-based YouTube star who was recently made a UN Change Ambassador. She mentioned that in one of her videos -- which offer a light-hearted look at everything from pre-exam panic to satirical differences between Arab and Western mothers -- she talked about her love of reading. Soon after, parents were thanking her for encouraging their daughters to read. She also told us about the importance of having a diverse range of female role models worldwide; about how women can discover economic and educational opportunities online; and that everyone benefits when women around the world are connected, educated, and able to use their capabilities to the full. 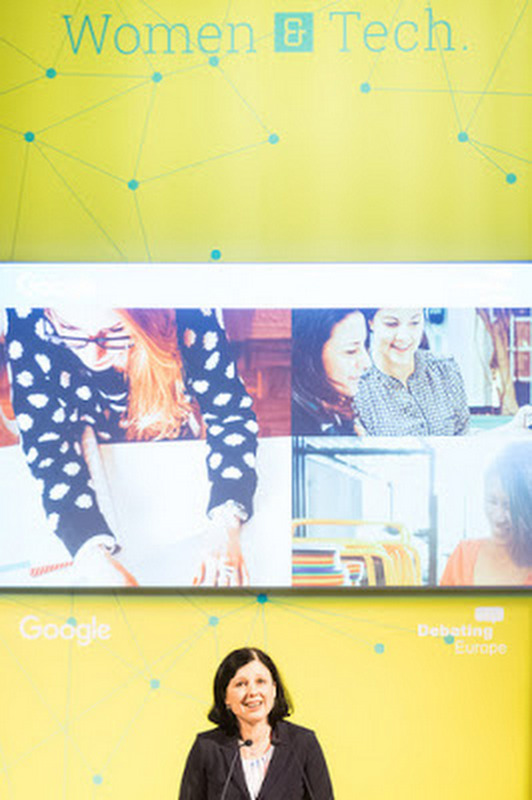 From Google, we invited Yvonne Agyei, our Vice President of People Operations.We know the most exciting ideas come from unexplored places: that's why with hiring, we extend our reach beyond traditional universities, helping us discover the talent of underrepresented groups, including women. We also invest in partnerships across the continent to get young people excited about computer science, like Lero’s Summer Computing Camp for Girls in Ireland. We’re pleased with the results, even though there’s clearly more to do. So far, 37% of Campus London community members are female, and 33% of our Madrid members are female. Our Campus Directors in London and Madrid - Sarah Drinkwater and Sofia Benjumea - are doing an amazing job in supporting greater diversity in local start-up communities. Of all the startups that make up our Campus community, 40% have a woman in the ‘founder’ team. All of this fits in with our wider goal of training 2 million Europeans in digital skills -- in fact, 43% of participants in our digital workshops, so far, are women. They include Romanian folk blouse retailers and a cat grooming service in The Netherlands. There's a lot to be optimistic about, but there's a great deal of work to be done as well. Great companies rely on great people -- and if women aren’t included, half the talent pool is absent. We want more stories like Mame Khary Diene, and her start-up BioEssence, more YouTubers like Hayla and her friends sharing their excitement about gender equality, and more coding workshops for girls like the ones run by Cheryl D. Miller of the Digital Leadership Institute. We look forward to training hundreds of thousands of girls and women in digital skills over the next few years.